Home/Auto Headliner Faqs/General headliner questions/We have a 96 neon with a sunroof, how do we go about replacing the headliner? We have a 96 neon with a sunroof, how do we go about replacing the headliner; do we remove the board from the car to do it? The best way to recover any headiner is to take it out of the car. I am thinking that the 1996 Dodge Neon didn't come with a sunroof from the factory (but I could be wrong??). 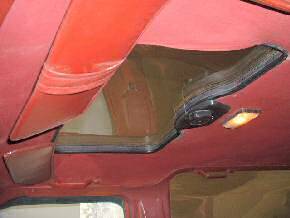 So that would mean an aftermarket sunroof installation, which would mean that the headliner material should be trimmed around the sunroof opening with a piece of black rubber (pull the rubber out and free the headliner board around the sunroof). If this is the case, take the headliner board out of the car, it'll be much easier to do. Below is a picture of approximately what I am talking about, note the black rubber trim around the sunroof opening! A small to mid sized car kit will replace the 1996 Dodge Neon headliner.